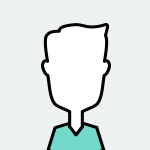 This is a guest blog by Andrew Wolk, the founder and CEO of Root Cause. In 2016, Andrew joined us on the esteemed Leadership Council, voting alongside other industry leaders to determine the final 10 Classy Award Winners. Partnerships can be tantalizing. They appear to promise wider reach or increased capacity. For those of us committed to improving lives in the social sector, whether through nonprofits, foundations, or the government, a partnership seems like it will bring great minds together for greater efficiency and outcomes. Often, it works. And often, as many of us have experienced firsthand, it doesn’t. That doesn’t indicate the partnership was a bad idea. I’ve seen well-meaning—even well-planned—alliances stumble when one or more of the partners just wasn’t ready. Let’s make sure that partner isn’t you. The most effective partnerships start with the most effective partners. Before you think about collaboration—before you can develop shared goals with others—you’ve got to look in the mirror. You’ve got to understand your own organization, your own capacity, and your own impact. That’s how you get ready. Organizations that are serious about making change are serious about performance measurement, first on their own and then in any partnership. They use data and evidence to find out how their hard work and investments are actually improving the world—or not—and they adjust their organization and programs accordingly. When you understand your own impact, strategize around it, and commit to sustaining a culture of rigorous, continuous learning, we call this high performance. When high-performing organizations partner together, they can drive results greater than they already do individually. 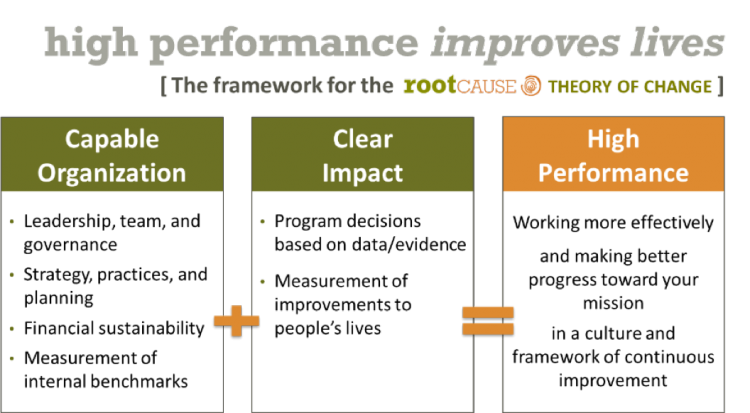 At Root Cause, the organization I founded and where I serve as CEO, we define effectiveness with what we call our “high performance framework.” You might use this as a starting point to define, measure, and generate high performance at your own organization. 1. Capable Organization: Are all the pieces in place to make your organization effective? From leadership, to strategy, to sustainability, to benchmarking—you want a well-oiled, high-functioning system. 2. Clear Impact: Are you collecting data from your programs to see of they are producing their intended outcomes? Are you making provable progress for your clients or cause? Are you changing course when the data doesn’t support your estimates or assumptions? 3. Synthesize these factors to generate High Performance: a platform of measurable change and a candid culture that welcomes continuous improvement. Now, I’m a big fan of learning from failure and encouraging innovation that takes (thoughtful) risks. The wise Seth Godin notes that publicly “failing on the way to succeeding” brings its own insights. Well-informed mistakes teach us how to improve. Yet those of us in mission-driven fields are keenly aware that the people we serve need more, better, now. We want to accomplish more effective and durable impact, faster. The stakes are high. Funding is scarce. So we hurry along, hastened by occasional data, some positive anecdotes, gut instinct, and an overwhelming sense of urgency. Here’s the thing: until we truly believe we have our own house in order, we incur an even bigger risk. We could actually be making things worse. Our assumptions can lead us to errors that cause roadblocks, require detours, or even send us off in the wrong direction. We want better for our own organizations, and that holds doubly true when linking arms and futures with other organizations. Therefore, when you rush too quickly into a partnership, it can mean more time spent questioning what you can contribute and what viewpoint you bring to the collaboration. Once you’re entwined, it’s hard to unwind, go back, and figure it out later. One thing to keep in mind: think carefully about the data you choose to collect (or require from your grantees). Having helped dozens of organizations build performance measurement systems, I would say we’re in a bit of a measurement frenzy. Many are inspired by the public interest in Big Data—how huge data sets can surface patterns to anticipate the market, or your next shopping order. But counting data without the scale, infrastructure, or strategy to act on it only creates information overload. Others are completing compliance reports because their funders or boards want to know outputs and outcomes, but have not yet identified which data actually indicates impact or informs decision-making. Ultimately, just because you can count certain numbers, should you? Funders and nonprofits alike may over-measure their programs, tracking as many metrics as they can to serve a range of purposes. And while this method may be comprehensive, it is not strategic. Measurement can lead to insight…or it can become noise, a distraction, or a drain on your resources. Now, if you’re thinking you may have some work to do before locking down a partnership, don’t be discouraged. You can still work with peers on a less intense level, while still reaping benefits of collaboration. An entirely viable, lighter-touch, lower-risk alternative to contractual partnerships is cooperation. One way you can “cooperate” with other organizations is to share data to achieve outcomes. Root Cause recently worked on a cooperative performance measurement effort with the Job Training Alliance, an affiliation of Boston-area workforce development nonprofits. Members work on a range of scales, with a range of performance measurement capacities. Together we identified the most meaningful data collected in parallel by many of their programs, then pooled, synthesized, and analyzed it. The result: powerful evidence that “Job Training Works, Pays, and Saves!”—and statewide clout for their issue, strengthening their opportunities to improve lives. Collective data is one way to dip your toe into the world of partnerships. This form of cooperation can be helpful for periods of time when your organization’s current strength will not achieve your goals. High performance is not only a goal, it’s a process. You’re never “done” improving. What’s important is getting started and striving to move further along the continuum. As you apply this approach to your organization and your work, you’ll improve your outcomes. You’ll also bring your team together in shared conversation about which measureable results matter most to you—and where you’ll focus, going forward. So—ARE you really ready for an effective partnership? Only you know the answer to that. But I can assure you that when your organization prizes clear-eyed data and evidence-driven rigor, you’ll have greater insight into how you work, what you value, and where you are strong. You’ll have a better sense of the alignment you seek from a partnership, or the gaps you hope a partner can fill. You’ll have language for the measurement goals you want to propose. In short, you’ll be far better equipped to work side by side to make meaningful improvements to our world. Andrew Wolk is the founder and CEO of Root Cause, a pragmatic partner to nonprofits, foundations, and governments. A social innovator, Andrew is passionate about using data, evidence, and high performance to improve lives. See Andrew’s full bio and the rest of the 2016 Leadership Council here.